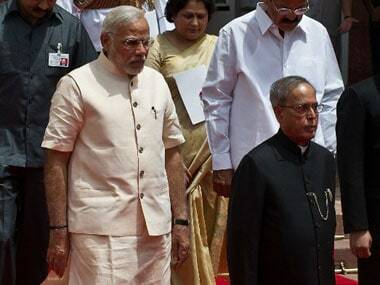 Move over Michelle Obama, Narendra Modi is here. No, we are not saying that the First Lady of United States should lose either her glory days, or her right to Vogue centre-spreads to our Prime Minister. However, New York Times is. Well almost. If the seven-point deconstruction of Modi's wardrobe that the paper has carried, is anything to go by, one is convinced that Narendra Modi has just dislodged Michelle Obama from the space she occupies as the poster-person of glamour in politics. While the fervent interest in the country's Prime Minister is understandable, it's amusing how there seems to be a need to find a story behind his wardrobe. And that too a wardrobe that Prakash Jha's costume designer could have dreamed up in his sleep. Kurta, check. Nehru jacket, check. Pyajama, check. Don't believe us? Here's proof. And here's further very good-looking proof of the same. Unless, of course cutting the sleeves off a traditional kurta to one-third its length demands an intense investigation, it is kind of difficult to figure out why there is a such an obsession with discovering the 'story' behind the 'Modi kurta'. While the zeal to attach a story to the Modi kurta can be still understood, the several theories around it can be hilarious to say the least. The article claims that 'never before has there been such a strong convergence between what a politician in India stands for and his clothing'. On what basis is this claim made? Sadly NYT doesn't elaborate. Given that the kurta (the long sleeved one) is worn by everyone from the aspiring Marxist in college to Manish Malhotra's models on the catwalk, what does it specifically say about Modi? Not much, except for the fact that he is averse to rolling up the sleeves of a long sleeved kurta. Then, the article goes on to list seven points on why the Modi kurta is unique. One of them being, it's a 'democratic' piece of clothing. Now what is a 'democratic' piece of clothing? If the definition of 'democracy' continues to be what it was, is it a garment whose several parts might be not exactly agree with each other, but still get along just fine? However, before we get too distracted, let's see how New York Times explains what they mean by democratic piece of clothing. It is democratic, because, apparently 'anyone can dress in the same way'. And right after, the paper explains how the kurta is in sharp contrast to his competitor prior to the polls - Rahul Gandhi. "Four: it differentiates him from his political rival, Rahul Gandhi, who favored simple white shirts to counter his family’s status as members of India’s elite, and who also came from the tradition of westernized Oxbridge dress,". Now unless the simple white shirt has gone for a recent low key makeover no one knew of and has suddenly become inaccessible to the rest of India's aam aadmi, it would be safe to say that this explanation is a bit of a stretch. And hello, the white Kurta - Pajama is traditional Indian neta wear. The only thing that seemed believable about the Gandhi boy's claims of being a politician, was in fact, his wardrobe. 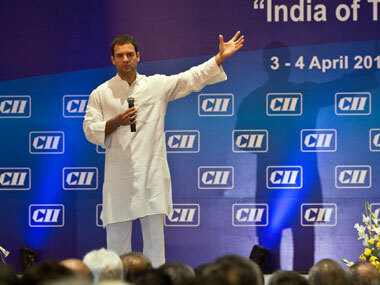 So much so, that in true Bollywood style, Rahul turned up in a white kurta-pyajama even in a suit and tie CII event! Rahul Gandhi in a kurta. AFP. Then, the article outlines, actually tries to outline, the ingrained humility in Modi's wardrobe. In the following lines. If you can successfully count the number of oxymorons in the above lines, you might as well try counting the number of words in Pranab Mukherjee's Parliament joint session speech that no one but Bengalis understood! Now, if the world has been enlightened enough, can we ask a simple question. Is it not possible that an Indian politician has good taste in clothes? Or maybe, even likes nice clothes? Oh no, the NYT thinks that politicians are dirty-looking pan spitting monstrosities, but anyone in India can point at how even Lalu Prasad Yadav turns up in the Parliament, to point out how mistaken this stereotype is. Unless of course the West finds snake-charmers a stereotype too last season and is sort of bored of Slumdog Millionaire now, why would they suggest that Indian politicians are a badly-dressed bunch? Also, if Modi dresses well, where's the harm in calling a spade a spade instead of making his wardrobe seem like a great political strategy instead of just case of great aesthetics? And the article doesn't stop with Modi and the humble but aspirational three quarter sleeved kurta. Apparently, it was thanks to Sonia Gandhi that the saree 'became a “cool” work look for many women', they say. You didn't know, but all the women you saw on the streets wearing sarees, before Sonia Gandhi hit the front page, were actually window shopping and headed for manicures though you might have thought they were off to work. During an interview with The Outlook, Amit Shah had this to say about Modi's dress of choice: "Let me tell you that the kurta pyjama that Modi wears is originally a Mughal outfit." And during his first Google Hangout, Modi himself had said that his choice of wardrobe was a convenient, comfortable and work-friendly one. So how then is Narendra Modi a 'Leader Who is What he Wears'? Not what he says. Not what he does. But what he wears. That's a question that neither he, nor us, will not find a convincing answer to.